Fire Emblem Heroes is still going strong with more and more content being added constantly. 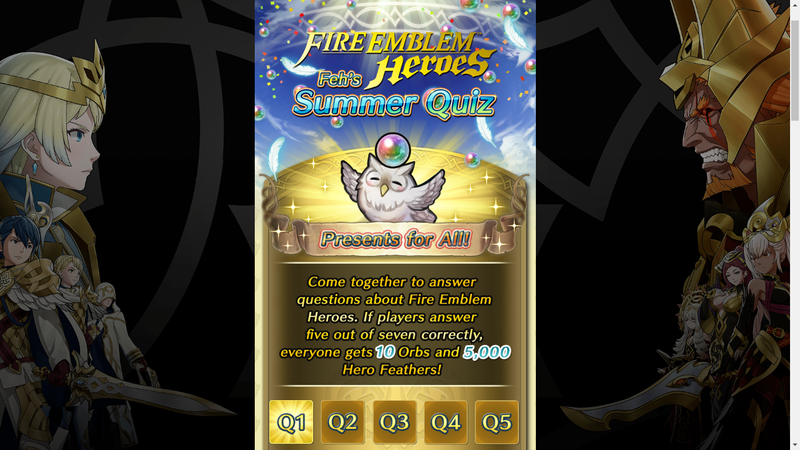 If you are an avid player of the mobile game, you may be happy to know that there are some free orbs up for grabs… if you participate in the Feh Summer Quiz of course. With seven questions to answer, one every day for a week. players must work together to answer five correctly. The correct answer will be revealed the following day and if players acheive the accumulative goal of five correct answers, they will be rewarded with 10 orbs and 5,000 hero feathers. That’s not all though as players will also be given a extra orb for every question they answer, regardless if they answered correctly or not. The Feh Summer Quiz is running from today until August 22nd. Will you be participating in the Feh Summer Quiz? Feel free to let us know in the comments below.